One of my New Year Book Resolutions was to re-read more books. Especially books that I don't have a review on and really loved at the time. Re-reading the book would have two assets: 1) I would be able to re-live that world and those feels and 2) All details would be fresh to mind to make a review about it! 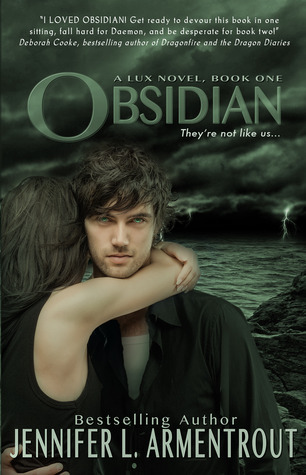 I'm not much of a re-reader and I think that's a sad thing so I'm making true on my Resolutions and re-read one of my first English books ever: Obsidian by Jennifer L. Armentrout! Gah! Obivously this is one of my most cherished books! Reason number one: Jennifer L. Armentrout is just like my best friend as an author. She writes STUNNING books! Reason number two: HELLO, there's a cute neighbor that hates Katy and makes witty comments that make you feel frustrated but you still WANT him. There are so many reason to love this book and I am SO happy that I re-read it. And another reason is that it was VERY easy to relate with Katy. Why? Because she's a fellow book nerd and she even has her own blog where she will post things about books and ramble about books. How hard is it for us fellow readers to relate to this character?! Of course there's more to Katy to love than only her love for books. Katy is just fantastic. If I could make any character real, she'd probably be that character. Not only because she's very sweet but also because of her determination and toughness. This we'll see when Katy is being tortured by the oh-so handsome bad boy from next door, Daemon. For some reason he already hates her and she will NOT put up with his crap. I look up to her for only that, she'll not let people run over her and decide things for her. That's a great aspect in this character because it makes her a strong female in the book and she'll need that strength for all that's coming her way in this book... Anyway that annoying, but handsome, guy also wants her to stay away from his sister and that's where we see another great side of this character: her compassion with Dee for having such a brother! But also determination will be present here, because she stays friends with Dee, no mater how much he doesn't want that. Lastly about Katy, I'd like to point out she's also very strong on the emotional side. Lots of things will happen with her, she'll start noticing weird things and she stays strong. Friends of Daemon and Daemon himself will also embarrass her during this read and that's when the real Katy Swartz comes: she's sarcastic, she's witty, and you better not get in her way! I loved this character so much because she had such a great personality, was so sarcastic and stood her grounds no matter how hard it was! As for Dee, she's all bright and shining! Readers will really appreciate her kindness and her brightness during the story. She doesn't have an easy life, especially with a brother who prevents her from having normal friends, yet Dee is that character that stays calm about it. She'll find a way and it will work out in her favor. Of course, we see an emotional side to her as well which made this character more diverse and more lovable! Other than that I'd like to point out that Dee is also one of my favorites, not because she's so talkative, bright and positive but also because she is really funny! Lastly a character I really want to give some attention is a character that also needs a lot of attention in the book: Daemon Black. May I introduce you to the guy that will rip at your heart, make you feel embarrassed to like him, make you feel amazing because you like him, make you feel FRUSTRATED because he's always hot and cold and who will just... make you go crazy! It's hard not to love him, all handsome boys but horrible attitude will grab your attention in a book and he will not change that! I really loved Daemon there's no other way to put it! Even after re-reading this book my mind has NOT changed a bit. He's so frustrating but that makes his character so much richer! You'll be at his lips with everything he does and says. He's sarcastic, strong, witty. He has an attitude and readers WILL LOVE IT! Little side note: I'm sorry for all these dramatic caps lock words, this book just does that to you. But he's not only talk, Daemon will surprise readers with his normal side, his lovable side. During the read we'll discover what's all about this character and why he acts the way he does. I can tell you the first time I read it, I was moved. Second time I read it, not much changed I was still moved! He will get under your skin and he's not even real, but believe me it's worth it. This character is in charge of all the things you'll feel during the read! It makes it even better and easier to relate to Katy and that's a great asset to Obsidian! As for the plot, it's a first in a series so everything is building up. We'll first be very new to the town Katy now lives in, which is an asset because we see and learn to see the things she's now seeing and experiencing. Which actually leads to our biggest discovery: Daemon! We meet with his attitude pretty early and later we'll be introduced to Dee. That's the start to the story and it'll lead to nothing too serious! We'll just meet the people, the town, Daemon will be not behaving himself and Dee will try to let him knock off while she hangs out with Katy. It all seems very normal, very like a normal life but don't let yourself be fooled! Pretty soon, Katy starts noticing very weird things and she'll think she's imagining it which I think was rather funny. When she talks about it with Daemon he'll also encourage the fact that she's hallucinating and this of course gives us a few funny encounters! Talking about funny encounters: Katy and Daemon will really give a lot of those to the reader. It all really starts when Dee does something to make him behave and Katy will have no other choice but go with Daemon to score bonus points with his sister! Believe me, you will not know how funny it all is until you read it! And many more of those funny things will happen. Yet to all funny comes an end when Katy is going to be attacked! That's really the moment that will make her see that there are weird things happening and she needs to find out what the hell is going on! It's also the moment everything comes in motion in the book. Excitement and a lot of thrill will be introduced when she's attacked and from that moment on, excitement and thrill will follow this character deeper into the story. Action will happen, suspense will happen, the biggest and weirdest discoveries! The plot WILL blow your mind and it will make sure you can't stop reading. Believe me on my word, Jennifer L. Armentrout does that to you! Above that the plot will be fueled by all the feels Daemon is spreading around but also the feels that hang between Katy and him. This goes from frustration to a normal attitude, to embarrassment to all other feels! The feels really are the asset to the book if you ask me. There will be no other way than feel with them, get into them and really feel it burn to the deepest part of your body. Next to suspense there's also the part where Katy is finding out weird things, she's attacked, something is up with Dee, there is someone missing and nobody told her about it. The reader, as well as Katy, will be confronted with weird activities going on and it's for us to find out if there's a connection. This is a very thrilling part to the book that also is appreciated! Lastly I also want to point out that even though the book starts basic and normal to suspenseful and action, the ending will also present an issue that will be dealt with in the following book. This is a very nice add to the ending because it gives something away so your curiosity is prickled but not enough to know what exactly is going on! 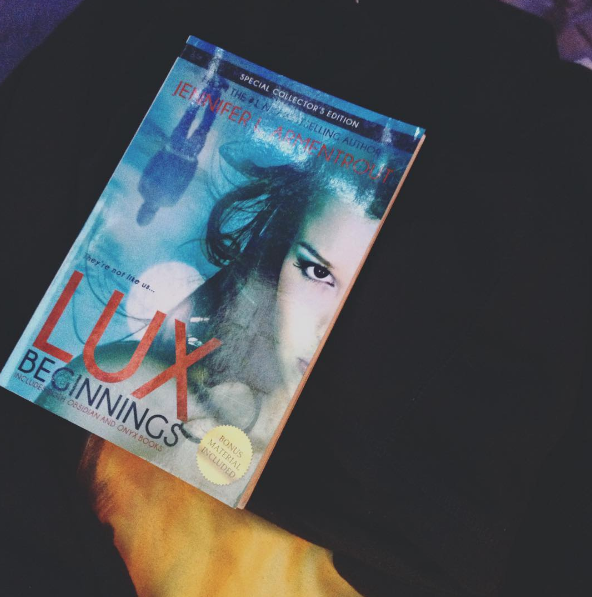 Already known in Jennifer L. Armentrout's style is the fluency in the book that will make it an easy to comprehend, just easygoing and enjoyable to read. But as I said this is something she's known for. To complete this review I'd like to point out that the characters are fantastically written, you can't do anything but love them. Katy is the easiest to relate to if you're a fellow book lover, but she's also the tough and strong female in this book that makes you really look up to her or see her as an equal. Dee will make sure everything is bright and positive and Daemon will fuel the plot by throwing with his attitude and feels. The plot is very strong and makes you ask yourself what on earth is going on. From a very basic, normal life we'll go into a swift motion to action and suspense, all the while we're trying to comprehend what's with the weirdness and secrets around Daemon and Dee. This read is very interesting for you if you love paranormal stuff, suspense, and a boy with an attitude that's hard not to love. “Will you show me what you really look like?"